I’m sharing three key lessons I’ve learned in the aftermath of having a serious accident in my workshop. What good can come from an incident leading to surgery and months of rehab? Listen now! Announcer: Becoming a Geek Leader. Tom: Have you ever had one of those really annoying customers who always seems to be looking to start an argument. Have you ever had a team member who just couldn’t let go and delegate work, but was always complaining about being buried? I’ve been there and I know how frustrating that can feel. I also know these things don’t generally get better on their own. People need help learning exactly how to communicate, delegate, manage conflict with others and plan more effectively. Now you know it would be great if you had a simple plan to address those needs, but you’re crazy busy, too, right? That’s why I created the Geek to Great 101 program. It’s a simple system designed for you to take a portion of your already scheduled team meetings, to play a video for your team, ask a few questions from the leader’s guide, and your team members will be able to fill in their own personalized action plan. It’s a great way to put a simple professional development program in place. Your team members will be able to share their plan with you and you can help them actually do it. Train your whole team for less than \$500. Find out more information and get immediate access to your first free lesson at brighthillgroup.com/helpinggeeks. That’s brighthillgroup.com/helpinggeeks. Tom: Hi and welcome to Becoming A Geek Leader. This is another special episode in season two. Today is going to be a little bit different from most of the podcast episodes. This one I’m recording as I’m preparing to recover from a pretty serious mistake that I made. 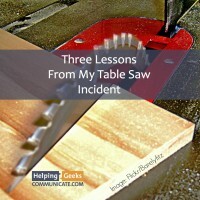 So I wanted to share with you three lessons that I learned from incurring a serious injury in my wood shop. These are ideas that you can apply even at level one, that individual contributor level of the four levels of thinking as a geek leader. So I want to thank you for joining me and I want to start out by saying that I’m gonna be fine. So lots of stuff to cover, so let’s get started. Announcer: Level One, Individual. At level one, you may even be a superstar technical resource. Level one focuses you on improving your technical skills. Tom: If you’ve been listening to my podcast for a while, you may have heard me talk about my pop. My mom’s dad. He was a research chemist and he was a hard-core geek, man. He could geek out with the rest of ’em. He had a bumper sticker on the back of his car about Avogadro’s number. Man. But what pop liked to do in his spare time was he did woodworking and one regret that I have is that I didn’t actually ask him to teach me more when he was alive. But after my grandfather passed away many years ago, I inherited many of his shop tools and I had always been involved in doing some work with my hands, but I really had not done a lot of fine work. And my grandfather was a cabinet maker. He did a lot of fine, detailed carpentry-type work. So over the last few years, I have enjoyed being able to start to grow my skills in that area and so I spend a decent amount of my spare time in my wood shop doing some wood projects. So of late, I’ve been working on a project for my wife. We have…she would love to have a desk to work on and we’ve got an area in the house that would be perfect for it, but we just couldn’t find a piece of furniture that really worked. And so I said, “Well, why don’t I make something that’s custom for that space?” So this is a pretty big table. It’s about 10 feet across and it’s about 2 and a half feet deep and we’re making it out of oak and it is just, the wood is just beautiful. I can’t wait to be able to get the whole thing put together. But if this gonna be more of a table and actually a desk, it’s gonna need to have drawers. So Holly found a set of cabinets that we could cut down to fit to make work underneath the tabletop as a desk. So I’ve gotten far enough in the project where I’ve got the tabletop built and I’m working on the cabinets. And I was very pleased on Saturday to discover that I could set up my table saw in a way that I could cut the cabinets down to be short enough to fit nicely under the tabletop. And that’s really where our story begins. So as I was working on that, I had the cabinet up on the table saw and I was working my way through the four cuts that I needed to make. And it was on the fourth cut that I made a serious misjudgement and I managed to cut my hand on the table saw blade. Pretty severely, in fact. I managed to cut through a tendon on my left thumb and what’s really unfortunate is I’m left-handed, so that puts me at a significant disadvantage going forward. And this brings me to my first of the three lessons from a serious injury in my wood shop. Lesson one, it only takes one second to make a misjudgement. It only takes one second to make a misjudgement. I have used a table saw for years and years and years, safely. I’m actually fairly careful in my shop. I insist that everybody wears protective gear. We’ve got ear protection and eye protection and hand protection. I have push sticks by my table saw…by all my saws actually. And I’m very careful to instruct my kids on safe workmanship in the shop. In spite of those precautions, in spite of not working when I’m tired, in spite of all the things that I’ve done, it just took one second for me to make a bad choice about where to put my hand. Now it was combined with other choices that I’d made as well, but fundamentally it just takes a second. Now what’s interesting to me about this particular lesson is that everybody makes mistakes. Everybody make misjudgements. Now I’ve got to be honest about my reaction. I was in pain and then as I was on my way to get care, I was angry with myself for having made a mistake, but the fact is that we all make mistakes. Sometimes they’re big mistakes. Sometimes they’re little mistakes. I’ve made mistakes in the shop before and I’ve been fortunate that some of the mistakes I’ve made haven’t been more serious. In this case, it was a pretty serious implication. You know, what’s interesting is in the last week since this happened, I’ve had discussions with friends about this mishap and what I heard is two of my friends had incidents with a chainsaw that could have been debilitating and one of my friends, who I know is very careful, managed to cut himself with an axe just in the last week as well. So everybody makes mistakes and you can’t focus on the mistake and you can’t beat yourself up because the fact of the matter is there’s no point in looking in the rear view mirror because that’s not the direction I’m going. I got a good lesson in this kind of attitude from my uncle. My uncle is in his 70s and he got an infection in his left arm. He was left-handed and ended up having to lose his left arm to that. So here he is in his 70s, learning to live his life as a right-handed person because he doesn’t have a left hand anymore. And he’s got a great attitude and he said, “Don’t focus on what you can’t do. Focus on what you can do. Don’t focus on what happened yesterday. Focus on what change you can do today to make things better for tomorrow.” And I just love that attitude and that approach. So really it just takes a second to make a misjudgement and everybody makes mistakes. Not only does everybody make mistakes, but nobody likes it. Once you make a mistake, you can’t focus on the mistake. You got to turn your attention to thinking forward. Now let’s talk about lesson two. When a crisis happens, it’s too late to prepare. When a crisis happens, it’s too late to prepare. Now I will tell you that I was very surprised when it happened and I was in pain and not happy about that, but all that time that I had spent working with Boy Scouts, learning about and teaching first aid really paid off because I didn’t have time to say, “Oh, what do you do when you get hurt? What do you do to deal with this type of injury? What is going to happen physiologically to me after this thing happens?” Because I had already made the investments in thinking about what could go wrong and what I needed to do when it went wrong, I was ready. And that included knowing who to call, knowing where to go and knowing how to get there. I’m grateful for the help that I had in the process in getting quick medical care from professionals who could say, “Nope, that’s too serious for us to deal with at the urgent care center. You need to go see somebody in the emergency room.” And even the emergency room person said, “That’s too serious for me to deal with for you. We need to get you to a surgeon,” and I’m preparing to have surgery even tomorrow to work on this. So my question for you around this is what is your plan for when the yogurt hits the fan? As you’re thinking about your projects and the work that you’re doing, what risks are you overlooking or are you pretending just don’t exist? I’ve told my kids for years, as they’ve been working with me in the wood shop, that you don’t have to be terrified of the tools, but you do have to respect ’em, that the reality is that the tools are unforgiving and they are very dangerous, and so you’ve got to be wise about the way you use them and I was actually unwise. So what is it you need to prepare for next? What is the thing you need to do? So you know, for me, one of the things is it just reinforces how important more detailed first aid training is for my kids. They need to know, what do you do when somebody’s had a serious injury? How do you respond? What’s important to matter? Another lesson for me around this, you know, when crisis happens, it’s too late for prepare, is I should have had more help in the shop. I did that reading about Sully and what happened in the Miracle on the Hudson and I was really interested in what the NTSB had to say and one of the points that I read about, as I was doing the research about for that other bonus episode of that podcast, is that a lot of times, pilots who are in crisis situations get overwhelmed with all the things that are going on and they forget to fly the aircraft. In this situation, I got overwhelmed because the complexity of the cut was too much for me to manage by myself. Physiologically manipulating this stuff, it was just too much and my brain overloaded and I made a bad choice. Another thing for me to think about from preparation perspective is do I need to invest in better safety gear? There are tools that will make my saw safer and maybe I should be looking at making those changes, too. But I have to be thinking about what I’m gonna do to prepare for what happens next. So we talked about it only takes a second for a misjudgement and you’ve got to focus forward and not backward. We talked about when a crisis happens, it’s too late to prepare. And now let’s talk about lesson three, it takes a team to get back on track. You know, from the moment that I had this injury, from the very moment I had this injury, my mother in-law said, “Hey, do you need help?” Yes, I need help. To everything…she helped organize and helped my kids get the stuff they needed emotionally and physiologically to take care of the needs that I had. My wife was terrific about standing by my side and getting me to where I needed to be. My mother in-law was great about suggesting that my eldest son come with us to the hospital. And Joel was great. He was terrific to be with my wife and me, to be an encouragement to us and help us navigate that journey that we were on. It took a team just to get us from the moment of crisis forward. And because I had built a team, because we had worked together as a team, because we were prepared for it, we could respond when the opportunity came. Now I should have had a team in the shop with me. Realistically I was working by myself and if I’d had some help, I probably would not have gotten overloaded. If I had planned better, I probably wouldn’t have gotten overloaded. But having that team there to support me would make a big difference. And even today, I’m working with a team. I met with a surgeon yesterday. We’re making preparations to connect with a physical therapist post-surgery and it goes on and on and on. And even as I go through this, I’ve had friends reach out to me to say, “Hey, Tom, we know you’re laid up because you only have one hand and it’s your good hand,” so much as…as good my left hand is. “Can we help you?” And being willing to accept help is challenging for me, but it’s a good thing for me to do and I’m grateful that I’ve got the team kind of coming alongside of me. Now the prognosis for my recovery is actually very good. I’ve talked with some friends and I’ve talked with a surgeon and basically what they tell me is that the likelihood is that I’m gonna get most if not all the functionality back in my left thumb, but we’re really not gonna know for several weeks. So those are the three lessons I have from my serious injury in the workshop. Lesson one, it only takes a second for a misjudgement and you got to focus forward, not backward because everybody makes mistakes. Lesson twp, when a crisis happens, it’s too late to prepare. You’ve got to be ready before the crisis hits. And lesson three, it takes a team to get back on track. So those are the three lessons and I hope they’re helpful to you. Tom: For today’s Episode Hack, I really wanna focus on lesson two. When a crisis happens, it’s too late to prepare. So what I want you to think about is in your projects, in the things that you’re doing, what are some things that could go wrong? Is there anything you need to simplify? When it comes to thinking about working with your team, what areas would be helpful if you had trained team members who could step in and do work with you or for you? And when it comes to those areas where team members could help you, who are you gonna train? On what? And by when? Just to be very practical, thinking about this project I’ve been working on for my wife, realistically I’m not gonna be able to get back to it for a couple of months, is my guess. Unless I can train the kids to help me do some of the projects that are ongoing and so I can supervise and help them, but maybe this is a great opportunity for me to invest with my kids. Think about for you and your projects and the work that you are doing, who on your team needs to know something? What do they need to know and when are you gonna teach ’em? And that’s today’s Episode Hack. Thanks for listening to the podcast. I appreciate having you on the journey. Now I don’t know exactly what’s going to happen in the next steps for me from a recovery perspective. As I mentioned, my surgery’s tomorrow and I’ll be working on physical therapy after that as well. But in a future episode, I’ll make sure that I include a Family segment that talks about what’s happening in my recovery and maybe there’ll be some lessons I can learn and apply from that, too. Thanks for listening. Hey, can I ask you something? Did you hear something helpful on today’s episode? Why not share it with a friend? On my iPhone, it’s as simple as hitting the three little dots on the bottom right of the screen, selecting “Share Episode,” enter your friend’s email and hit “Send.” Why do this? Two reasons. One, your friend or co-worker will thank you. You’ll be seen as a source of helpful and valuable information and they will appreciate you for it. And number two, I need you to help me get the word out about this podcast. I’m working hard to bring great ideas and great content to you and it’s a big help to me if more people hear those ideas. Go ahead. Share it now. I’ll wait…Thanks.